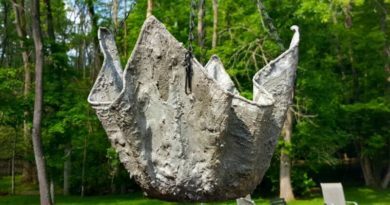 So Many New Tufa Pots Made This Summer! I really miss the warmer weather. It was so nice to be able to go find some container to use for making some new tufa pots. Anything works!…almost. You can make small ones using a cheese box, yogurt cups, whipped topping. See what I mean! You can use disposable plastic containers, margarine cups, whatever. I have used cardboard boxes nested inside each other. If you check to be sure that you have a gap between the outer box and the inner box about 2 inches wide, then you are good to go. This also applies to any nested set of bowls or anything else. 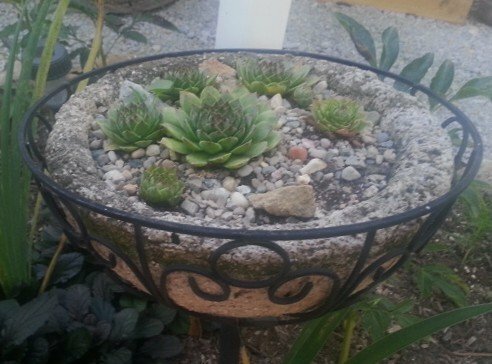 A square or rectangle box outside with a round or oval bowl used as the middle planting area looks very “zen” to me. Wooden boxes are fine if they have a sloped edge with the widest edge at the top. 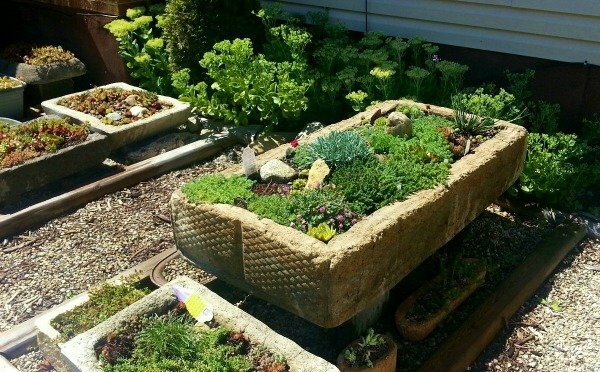 You can try to build a wooden form with sides to screw on and off so that you can easily release your finished planter. Or use a thick sheet of Styrofoam , cutting the sides to your desired lengths. You can put together with long nails, or duct tape the outside all around to keep strong. Build this one on a board platform which will support your “bottom” until it is dried. See other ideas in Choosing a Hypertufa Mold Form. I have made some large outdoor planters which can hold a small tree or shrub. My biggest tufa pot is a large landscape planter which is about 2 feet by 4 feet and I think it has been my favorite so far. I will make more of these landscape planters this next summer because they seem to be the best for my plants. 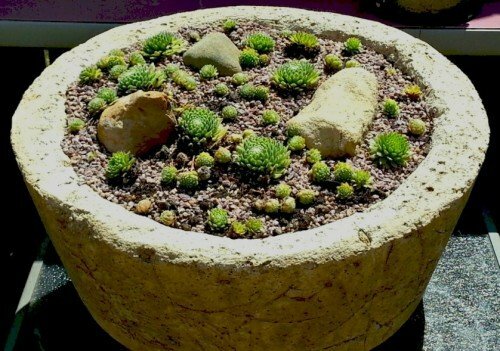 I really think it is the depth of these tufa pots which make the difference in how a plant will root well and survive any stress. 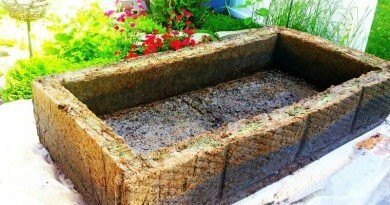 The porosity of the large garden planter allows it to drain well, as that is the nature of hypertufa, so the roots are never water-logged. But since this large planter has such a deep soil area for the roots ( about 11 inches deep in my largest planter), it seems the roots can dig deeply into the soil and are protected from excess heat and scorching which might occur in a more shallow pot. You can see how well these plants have done in the large concrete planter. It looks like concrete, but since it is hypertufa, it wasn’t quite as heavy to move into place. Though with the size this one turned out to be, it certainly wasn’t light! 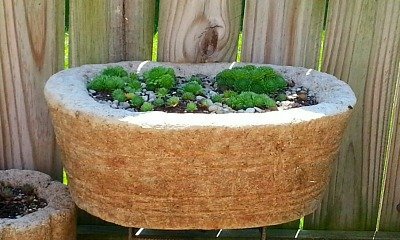 Please at least try one of these garden hypertufa planters and you will love it. They work as a patio planter or even indoors to grow herbs in your kitchen window. Watch some of the videos to see how it is done. I am sure you can do it! ← 30 Minutes To Quick Beef Stew for Dinner! 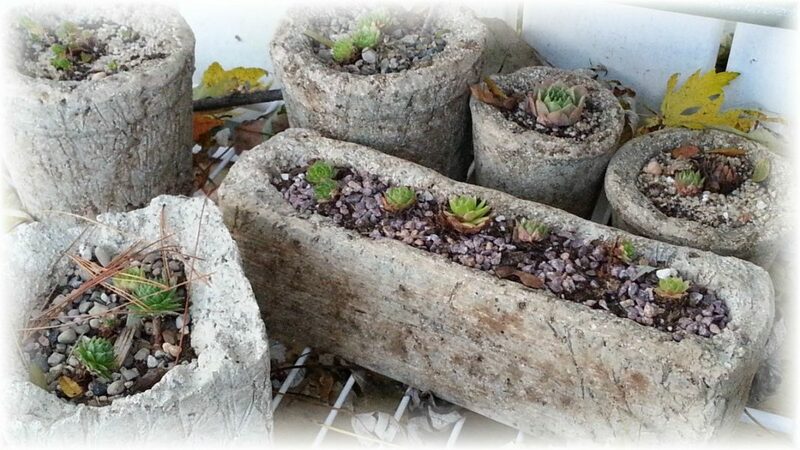 Unconventional Hypertufa Hanging Pots….or I’ll Try Anything!